Here's one more female-fronted melodic metal band. 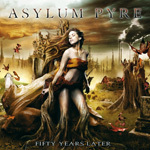 Asylum Pyre comes from France with their second album, Fifty Years Later. While these types of bands are in abundance these days, it would be grossly unfair to cast Asylum Pyre into the whole symphonic power metal category. This band has some diversity to their music. Asylum Pyre: looks cold, light a pyre. First, to their new vocalist, Chaos Heidi: she's a classically trained singer and vocal coach with tremendous strength and range. She's not dramatically operatic, though she can be, but neither is she a metal screamer. She does sound very good across this entire album. Heidi is one of the better female vocalists in the melodic metal arena. Conceptually and lyrically the album follows their previous effort voicing concerns over a world ecological crisis in climate change. Asylum Pyre points 2009 United Nations Climate Change Conference as a failure and considers the hazardous results Fifty Years Later. Musically, the songs express great depth and diversity in the arrangements. This is mostly melodic heavy and power metal, with notable progressive nuances, built upon strong melodies and musicianship. There's songs which are heavy and speedy like Dead in Copenhagen and These Trees. Then there's simply light material with Fisherman's Day. Or a combination of all these in epic fashion with Any Hypothesis. The title cut, which turns on the range of Heidi's vocals and wonderful melodic chorus, is a pure delight. Now and then there's some growling male vocals for accent, but that's only small weak point. Fifty Years Later is strong and entertaining second effort from this talented band. Fifty Years Later is strong and entertaining second effort of melodic metal from this talented band.